Desert- This stunning style is highly underrated. It features shiny, sleek fur that matches the color of the dashing desert sands, allowing your Kougra to resemble a true denizen of the Lost Desert. The terrific tan color is allied with a brilliant blue hue which enables striking contrast between the two shades. The combination is very flashy and pleasing to the eye. Furthermore, this outstanding option includes a glorious headdress, necklace, and arm cuffs. These assets are treasures which your Kougra would not be complete without. Eventide- This pretty pick showcases a timeless, picturesque view of the setting sun. The radiant rays of sunlight begin at the paws, then fade into crimson-colored legs and eventually evaporate into a brilliant blue body and head, adorned with the sparkles of a magnificent night. This stunning sight is bound to evoke many rustic, idyllic memories from within almost any Neopet. Therefore, this splendid shade constitutes a true conversation piece. Faerie- This magical minion boasts luscious lavender fur that features blue stripes. The intense shine and color of this creature's coat is a beauty to behold. However, the crowning glory of this style lies in the pair of large wings that the Kougra is blessed with. They not only grant him or her the ability to fly but also bestow a state of real resplendence upon him or her. Fire- This flaming friend is a true winner. It showcases sleek black fur which is allied with blazing orange stripes that represent fire. They jump out at me because they resemble real flames. The bottoms of its paws are yellow, creating an interesting detail. I get the impression that this creature is speedy and superbly stylish in its own way. Halloween- This creepy pick is a far cry from the majesty of Faerieland. This Kougra, themed after Halloween, bears sleek black fur as it sprints through the shadows. The crazy creature is unmistakable because it, too, carries a pair of wings, yet these awe-inspiring appendages constitute true spookiness with their pointed edges and muted orange hue. A pair of sharp, gleaming fangs creates the finishing touch. Island- This spunky shade showcases sand-colored fur adorned with bright white stripes. However, the luscious lei worn by the Kougra does the creature more justice. It features brilliant blooms of crimson and cerulean hues which exude amazing fragrances. Other Neopets will feel compelled to find the source of the sweet, pleasing smell. A wooden tail ring tops off this trendy look. Maraquan- This outstanding option is sure to appeal to those of you who enjoy underwater themes. The Kougra's green skin is complemented by dark purple stripes, creating a nice sense of contrast. While this Kougra may have arms, it boasts a mermaid's tail in place of two hind legs. Fanciful blue and green fins complete the appearance. Orange- If you are in search of a dirt-cheap method to obtain a cute painted cat, then this shade is for you! The Orange Kougra Morphing Potion is extremely affordable on the Shop Wizard at the time of writing. Regarding the pet itself, its outstanding orange fur is paired with dark blue stripes, obtaining colorful contrast. Orange and blue are complements on the color wheel. Sunny yellow eyes create the finishing touch. Pastel- This charming choice reminds me of splendid springtime mornings. The Kougra's fur bears a cheerful minty color paired with light pink stripes. Many dazzling dresses, some bearing flowers, would complement this color of fur very well. A full springtime customization would complete this fresh ensemble. Pink- This classic color will cover your Kougra in an entirely rosy hue. The light pink fur is adorned by dark pink stripes, creating a magnificent monochromatic color scheme. However, the Kougra's striking sky blue eyes contrast well with the fur, topping off the look. I am a fan of the blue eyes because an entirely pink pet would surely be boring. Plushie- This stitched companion features lavender felt allied with red and yellow stripes. This creature's soft fur is pleasing to the touch; you can even use your Kougra as a pillow at night if he or she doesn't mind. Furthermore, the red stripes contain pretty polka dots, creating additional flair. I enjoy the eclectic color scheme that this brilliant beauty bears. Royalgirl- This pretty princess boasts cream-colored fur paired with lavender stripes. This already lavish look is allied with the most regal attire. The Kougra wears a purple cape of the most luscious velvet, adorned by spotted faux fur trim that largely resembles the real deal. She also wears golden arm bands decorated by colorful jewels that are sure to attract attention. Her pretty head is topped with a terrific crown consisting of purple velvet, gold, and a giant, glorious ruby. Spotted- If you thought that the Fire Kougra was agile, then watch out for this charming cheetah! The Spotted Kougra features terrific tan fur and black spots, just like the famous zoo animal. I'm surprised that the claws on this creature aren't more pronounced. Nevertheless, it's an outstanding option for those in search of a cool Kougra color. Beautiful brown eyes top off the look. Transparent- If the Halloween shade isn't for you, then the Transparent option is a nice alternative. It mainly focuses on the Kougra's skeleton, yet you can also see the internal organs somewhat. The skull features two hollow black sockets for eyes. This creative color is very spooky in its own right. 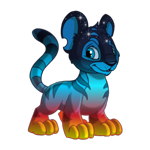 Tyrannian- If you have limited Neopoints, then this color is for you! The Tyrannian Paint Brush is buyable at the time of writing, though not as inexpensive as the Orange Kougra Morphing Potion. Nevertheless, this cunning creature boasts superb style. Jagged black stripes race across its muted yellow fur, creating a tough persona. Sharp black claws and a pair of long tusks complete this amazing appearance. These are my recommendations for the most dazzling cats in Neopia. Any Kougra in search of a paint brush should definitely consider these varieties. However, I recognize that the choice is difficult because you are confounded with a myriad of shades. If you enjoy an alternate hue, feel free to select it. I hope that Kougras everywhere will find the color that is right for them.